One of the most frequent things Mike and Mariarosa hear when people meet their baby boy Dante is that he’s so tiny. They beg to differ. “He’s so big!” says his mom. At just a little over four kilograms, she has a reason for saying that. When Dante was born in September 2015, he weighed only 620 grams. The school year had just started and Mariarosa, a teacher, was back at work. She was less than six months pregnant at the time so when she felt a few contractions she thought they were the Braxton Hicks type. “I called Info-Santé and they said go to the hospital just to be sure.” Within hours of arriving at Maisonneuve-Rosemont, she was transferred to the pre-natal unit at the Jewish General Hospital and put on bed rest. “At that stage of pregnancy, every day counts,” she says. “They just wanted me to stay completely still in the hope that I wouldn’t go into labour.” Despite everyone’s hopes, Dante arrived just one week later. There are many possible complications in the first weeks of a premature baby’s life. At six weeks old, Dante developed necrotizing enterocolitis (NEC), a condition in which tissue in the intestine becomes injured or dies off, causing inflammation. As a result, he was transferred to the Montreal Children’s Hospital neonatal intensive care unit (NICU). “We were living minute by minute,” says Mariarosa. “The world around us stopped and it was all we could focus on.” After a month and half, the doctors could see a stricture in Dante’s intestines, so they decided to operate to remove the damaged tissue. Two days later, it necrotized again so Dante underwent a second surgery. Dante has had his share of other problems too: he caught the flu over the holidays, and has had multiple infections. He also had to stay intubated for two weeks after surgery. 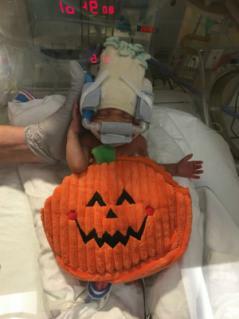 Dante is on CPAP (continuous positive airway pressure) for his breathing and will eventually shift to high-flow oxygen, then low-flow. He has been fed almost exclusively through an IV tube so as he shifts towards regular feeding, he’ll be closely monitored to make sure his stomach is still fine and that he’s digesting food properly. The focus now will be on improving his breathing and feeding so he can eventually go home with his mom and dad. It’s a day they both really look forward to. 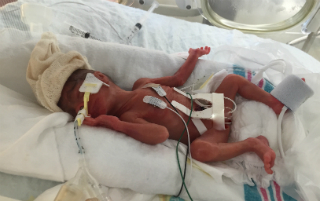 The couple say that the one constant positive has been the NICU team. “They look after the baby, and us, as parents. They cheer on Dante and their love and devotion to their work is very evident. We will miss them when we finally go home."